New Posh manager Grant McCann (left) with chairman Darragh MacAnthony. Photo: Joe Dent/theposh.com. Anyone else notice the calmness around the ABAX Stadium? The usual pre-season bluster of winning promotion with 100 goals and 100 points (copywright Barry Fry esq) has been noticably absent, and I for one quite like it. Harry Beautyman, good enough for Cobblers, not good enough for Posh. 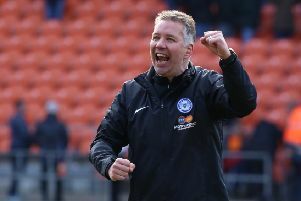 Posh fans, and some club officials, have no right to expect a place in the Championship just because we battled gamely up there for a couple of seasons recently. There is nothing wrong with having ambition, but screaming hyperbole from the rooftops is a silly tactic that invites mockery from others and dismay from our own fans when it goes wrong, as it often does to clubs with fan-bases out of all proportion to expectations. New manager Grant McCann (right) is a quiet man. He’s a softly-spoken Northern Irishman, but he won’t suffer fools gladly and he won’t shirk from the tough decisions. I have a good feeling about his management (admittedly for no other reason than the respect he so obviously garners from pretty much everyone in football), but do I expect tangible success this season? Not really, but I do hope he is given enough time to clear up the wreckage left behind by Graham Westley. Michael Bostwick is facing a battle to win a Posh first-team place. Photo: Joe Dent/theposh.com. It took Preston a couple of seasons, and the appointment of a proven League One promotion-winner in Simon Grayson, to recover from that one man’s madness. I wouldn’t be surprised if the same happens at Posh under a rookie boss. McCann clearly has the necessary ruthless streak. He didn’t offer a friend, a team-mate and proven warrior in Gaby Zakuani a new contract when doing so would hardly have caused a ripple of protest. He was quick to decide Harry Beautyman was good enough for Northampton Town, but not Peterborough United and he will clearly pick starting line-ups on form rather than reputation as Michael Bostwick appears to have found out. McCann possesses clarity of thought unlike his muddled, stats-obsessed predecessor and he must be given the freedom, as well as the time, to turn those plans into a successful formula. For what it’s worth I agree with the bookmakers who make us 18/1 tenth favourites to win League One. I suspect, like many other clubs, we will flirt with the play-offs at times, but patience will be required with a new team. Posh look to have improved their defensive unit, goalkeeper Ben Alnwick looks sharp and midfield places will be hard to win and hard to keep. My main concern is the absence of a striker who will score 15 League One goals. The three most attacking players in the Posh squad, Marcus Maddison, Paul Taylor and Shaquile Coulthirst, might need their own ball to play with this season. Mind you I never expected Conor Washington to embark on the sort of scoring spree he enjoyed last season so what do I know?